The living area is ideal for quick naps and movie marathons. Cream-colored drapes, a shag rug, and an inviting sofa make the living area the best spot for catching up on your favorite shows, and getting some shut-eye. The sofa is big enough to accommodate friends and siblings during sleepovers, too. Since Maxene has a huge floor area, she can easily roll up the rug and prep the space for a quick workout. Notice the work of art on the wall? It's a labor of love by Maxene's soon-to-be husband, guitarist Rob Mananquil. It perfectly matches the living area's color scheme. Sweet and light colors liven up her home. One of the pieces that caught our eye in the unit is this dresser. According to Maxene's post, it's one of the first pieces she got when she moved in. Aside from its vintage feel, the dresser can also fit in a country- or modern-inspired space. The lavender and white touches go well with Maxene's style, too. RL Tip: The vintage and bronze drawer pulls complete the look of this piece. To change the look of your cabinets, you can easily update the knobs and pulls. Shop for accessories at Wilcon Depot. Hints of pink and Hello Kitty items make her home unique and personal. Whether it's mugs, pillows, and figurines—the things we collect are given a special spot in our home. 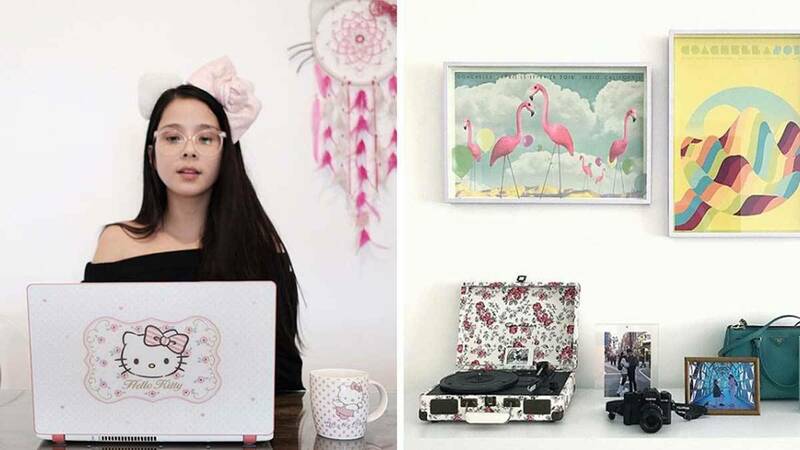 To say that Maxene loves Hello Kitty would be an understatement: she has several decor items, a laptop cover, mugs, and other collectibles. Take your cue from how she showcases her well-loved items by limiting the number of items you have on display—this prevents clutter and the appearance of an overdecorated space. The must-haves that spruce up her home are well-chosen. To liven up a plain nook, the actress chose to showcase a few memorable photographs, various frames, colorful prints, a turntable, and her camera. Her caption says it best, "photos and memorabilia deserve a special place at home." The framed prints on the wall are souvenirs from past Coachella festivals she has attended. Her bedroom spells comfort and relaxation. She knows how important it is to invest in quality must-haves.